… discovering the Greenup (Yellow Down) hole. UFO is Uffcott. Maybe UFON. It’s fun! Virtual VWX Town is set up in Uffcott. Marriage. Black Lodge and White Lodge. Ray… Away the Ray. … save for this one, also found in the 1st collage of the Gilatona-Lis series set up in the Power Tower Gowlery of Rubi’s VWX Town, most recently. 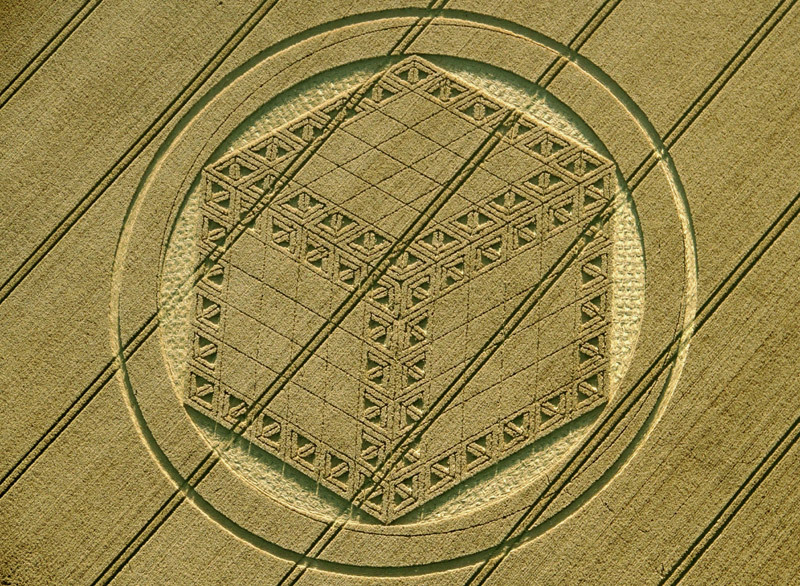 The Hackpen Hill crop circle pictured above also appears in Gilatona-Lis, starting in Gila 04. I identify it with a 3rd eye cube of some sort, indigo in symbol. Currently I’m reading through all the Gilatona-Lis posts on this blog, focusing on the interpretations. I’m wondering if this Hackpen Hill cube, with its small, hollow interior cubes inverted in respect to the small, hollow exterior cubes, is the same as Mr. Boyce’s cube from The High Octave Story at the end of part 2 of 3, or the middle part? It is indigo at the 7th perspective — sort of explaining my indigo reference above or continuing it. To summarize Latona 01, it seems to be about the destruction of New Pietmond, coupled with an exodus factor, like Lisa V. is using the Cherhill “monster” (riding in its brain) to escape, and also the orange (inverted color) sunfish to the left. It’s a bit of a scene of chaos — dishevelment. So what does Latona 02 bring us? Stability? 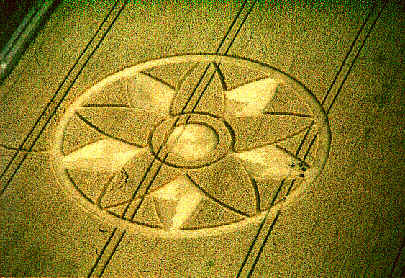 Well, we’ve returned to Wiltshire and the crop circle region for more images for sure, so that helps with the grounding. The locations are from around but not within West Woods to the west of Marlborough, and one of 2 woods I’m really eager to explore during my England trip. As I’ll use West Woods for the culminating 3 collages of the Latona series, we must keep this in mind, maybe like I was close to the mark on this collage (Latona 02) but hadn’t quite hit it yet. Also the “singing Hermans” used in Latona 02 will return in Latona 08 09 10 (the West Woods collage), and employed in a more logical manner. They seem to be, when set up correctly, a protective device created by Lisa V. to, among other things, calm me in England while I’m there. In theory. Kind of like I’ll be in suspended animation. But back to Latona 02, I don’t think I quite knew what to do with the Singing Hermans in this one. The 2 very similar images (“singers”) were very close to each other in a search fo Rockley images, so both come from that area (north of Marlborough and the setting for a number of collages already in Gilatona). I knew their proximity was synchy, but only with Latona 08 09 10 did their meaning start to clear. Latona 02 is about death. The father of a good Internet friend died around the same time. I also thought of the death of my own father during the composition. The sun “swallowed” by the moon in the dew pond at the bottom of the picture (dew pond near Knap Hill). It is also about the death of Virgo (father) inside the direct opposite sign of Pisces (mother). It is both death and sexual union in this manner. The dewpond is both womb and tomb. St. John’s Church in Devizes is important to go to, baker b. Go to the graveyard in the back. Look for [delete name]. Hmm. I got behind you there once again. Adding text behind you when you’ve already talked. [Delete name]. Remember that. Make a collage of it as well. It is *the dewpond*. 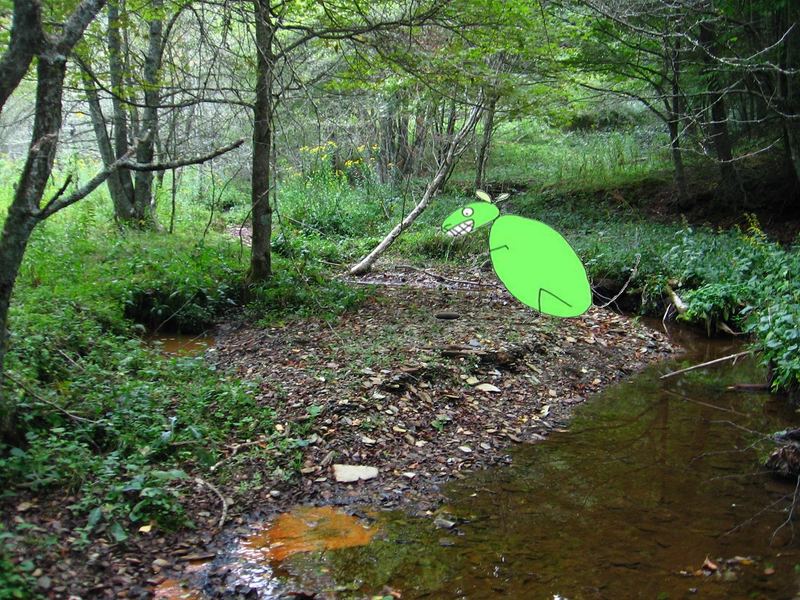 To continue with this, I believe the dewpond is also Drink Lake of Herman Park, as Master Shake, a drink after all and nothing more, is directly above it, hovering. Then the bottom Singing Herman is also Drink Lake, or just “Drink”. To give more detail he is a *fis*Herman. The line or cable in the collage, inside Shake, might then be a fishing line (extended from his purple straw), which saves the tiny Dr. Who here from the Satan Pit, which is also death most likely — the dew pond. Life is also sun — king/father and death is queen/mother. The letters on the sun and moon at the dew pond come from SID’s 1st Oz, and the 2007 Booker T. 15 part analysis of this pivotal audiovisual synchronicity, my most original contribution to the Golden Age of that now almost forgotten field. We have a field here as well. Dewpond field. With rocks. The dew pond is also probably Winesap, don’t you think Hucka D.? Okay. So as we’ll see, the Singing Hermans are also placed on rocks that Lisa the Vegetarian has just been seen sitting on earlier in the Latona series, or Latona 00. It’s the same rock. And then this rock will also reappear in Latona 08 09 10 with Lisa V. again perched upon it, joining the 2 Singing Hermans also perched upon the same. Confusing. The Hermans are the same as Lisa the Vegetarian. She had to equalize the 2 parks, the 2 Hermans in this way. Frank equals Herman. Heman to Herman. She did it through the diamond. That’s the diamond that goes in the dogs tail to wag it. I can’t just take it out of the ground Hucka D.
Why not. That’s what she put it there for. It belongs in the dog’s tail. Wag the dog. Nothing is really resolved in Latona 02, Hucka D. Shake seems to center, and that’s what we have as a stability point in this one. But he has to be hollowed out to see the actual, inner workings or goodness. Jesus saves, I suppose. Yes, Master Shake is Quetzalcoatl is Jesus. Indeed. So we should probably move on to Latona 03 and 04, and this is a joined effort this time, Hucka D., and something quite new in my collage producing. Latona 04 was actually composed before Latona 03, and this makes it a Wheeler-Wilson situation, like we have occurring twice in SID’s 1st Oz, but the first use of it in that a/v synch sets the tone and embodies the symbolism. A nurse name Wilson (Head Nurse Wilson) and what we know will become a Wheeler in Oz for Dorothy wheels in Dorothy to the electroshock chamber on a gurney. When she arrives there, the failed electroshock treatment, which goes wrong at the very last second, is dubbed with a song already used in SID, but the *first* part of the song (introduction) not used before. This is Queen’s “Death on 2 Legs”, the first track of Night at the Opera. So we’ve reversed the two parts of the tracks in SID, with the intro coming after the song proper. This is Wheeler-Wilson. Time has become suspended because we have no past and no future here. Only present. Which may be the same as Norris. Space of Norris. That’s my phrase. Anyway, we have Latona 04 on the right and Latona 03 on the left. Or is it the other way around — we just can’t really tell. We have to assign the number arbitrarily. This is what interested Booger Hays when he visited your Power Tower Gowlery. He looked at Latona 04 and then Latona 03. “What is actually happening here?” he asked. Well, I said it has something to do with Dr. Who, which of course I had to explain to him, him being from the 19th Century and all. I said that the red headed lady, or the “red lion” entering the pub the Red Lion, or standing beside it in the parking lot, is probably Melonie Pond, who has just died in the Dr. Who series along with husband Rory. She is defined by her red hair, you see. (pause) Oh, I said Melonie but I meant Amy Pond. To remind: Dew Pond at the bottom of this collage, Hucka D.
Yes. The former collage [Latona 02] you mean. And in Latona 03 04, we are in Avebury, re-centering ourselves as it were. We have a kind of before/after story in the two sides of what in effect is one collage, but it’s difficult to discern what is before and what is after. So I think this is also about the death of Amy and Rory Pond in Dr. Who, Hucka D. Talking about Latona 02 here still. We must move to Latona 03 04 fully, however.